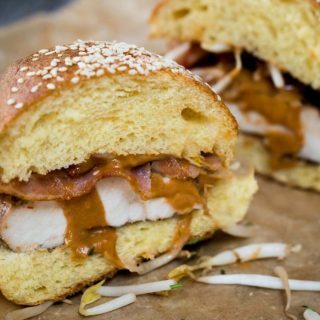 This Thai Peanut Chicken Sandwich recipe is sweet, savory, spicy, creamy and crunchy. But best of all, it’s delicious! If you’ve been visiting for a while, then you know my mother didn’t love cooking the way I do. Sandwiches in my house were something between two pieces of store bought white bread. Fancy meant that it also had mayonnaise or cheese on it. It took me a long time to redefine what a good sandwich is. This Thai Peanut Chicken Sandwich is definitely a good sandwich. A few weeks ago John and I went on a bike ride and ended up at one of our favorite places to eat. I was looking at the menu, and while I didn’t order it, there was this sandwich that looked interesting to me. I took this sandwich idea and started deconstructing it and putting my own spin on it. I think that’s what food people do don’t they? 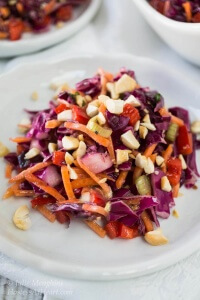 The result is this easy and delicious Thai Peanut Sandwich! To assure that the chicken breasts were plump and moist, I infused them with a delicious ginger marinade before they hit the grill. 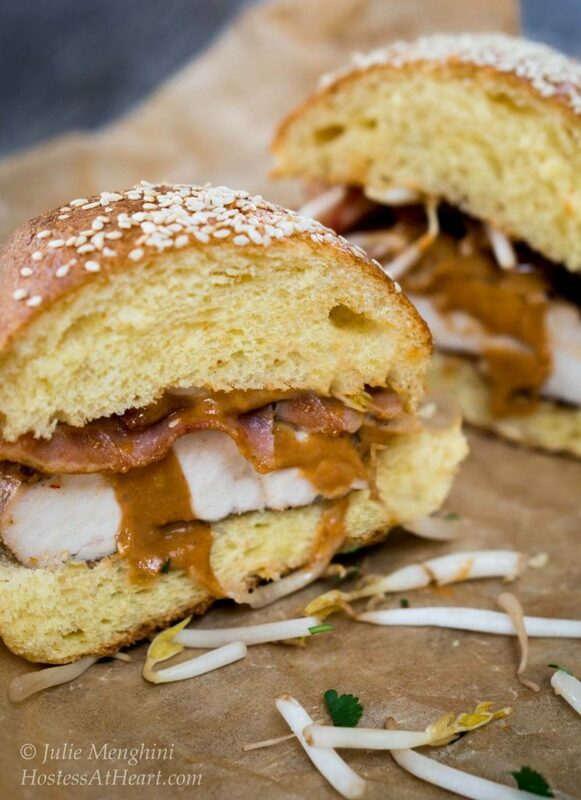 The chicken is then topped with bacon, peanut sauce, and a sprinkling of bean sprouts, all on a homemade buttery brioche bun. This sandwich is sweet, savory, spicy, creamy and crunchy. It is definitely not your average sandwich and deserves the distinction of being a main dish meal. 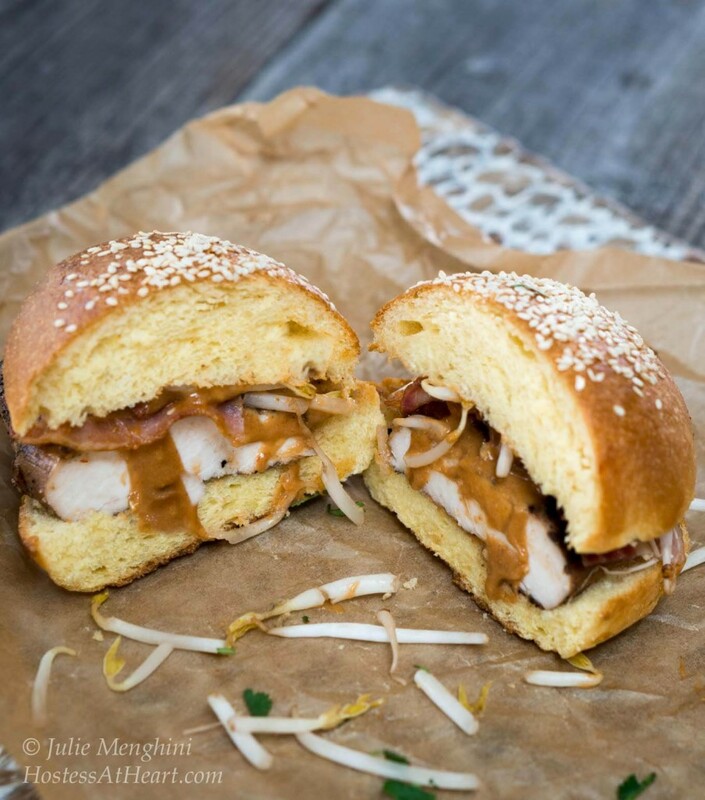 This Thai Peanut Chicken sandwich is sweet, savory, creamy and crunchy. It is definitely not your average sandwich and deserves the distinction of being a main dish meal. Combine marinade ingredients in a container or ziplock bag large enough to hold chicken breasts. Add chicken and refrigerate for at least 30 minutes or up to a day. Grill chicken until it measures 160 degrees F.
Fry or bake bacon. Drain and set aside. Combine all of the peanut sauce ingredients in a saucepan. Heat over a medium heat until simmering. Continue cooking 2 to 3 minutes, whisking continuously. Set aside or refrigerate and allow to cool. On a fresh bun, top chicken with bacon. Drizzle peanut sauce over bacon and sprinkle with bean sprouts. 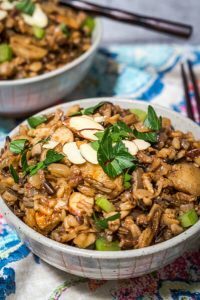 Serve with additional peanut sauce. Peanut sauce adapted from http://www.melskitchencafe.com/easy-5-minute-thai-peanut-sauce/. If you are looking for delicious side dishes to go with this sandwich, here are a couple great ideas! I love Thai food, so I know I will looooove this sandwich!! Looks and sounds fantastic Julie!! Thank you Naina! I always love a good sammie! Love your post Julie – a little bit of nostalgia for your posh sarnies of childhood warmed my heart even if you were un-impressed 🙂 I have a love thing going on for peanut butter at the moment. I really want to try this sandwich – I even have some posh peanut butter on the go at the moment. Next week I have a day where I literally have no time for a main meal due to running around after kids & school so i might get organised and get everything ready so I can compile this late night feast when my day is over. Thank you so much Jane! This sammie was one we really enjoyed. I’ve never heard the phrase posh sarnies. It’s a bacon sandwich right? I just learn so much at this job. Have a wonderful day my friend! Ha thank you so much Jane! Now I know LOL. Yum, this looks so good! I absolutely LOVE peanut sauce, AND this has bacon. So basically, perfect. Thank you Meghan! We love bacon too! This looks soooo yummy, Julie – some really awesome flavours in there. 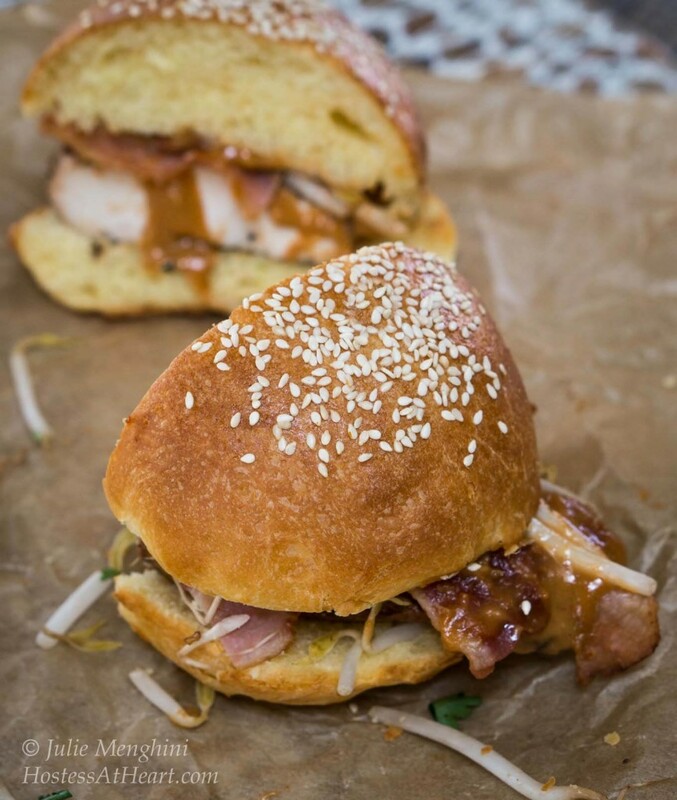 You can’t beat a good sandwich, especially on your fluffy brioche rolls! Thank you Michelle! I don’t make enough sandwiches! I always think they are a dinner cheat but I don’t know why. I’m a head case sometimes! Thank you Judi! Enjoy the weather and gardening! It’s pretty quiet on the blogging side anyway. See you when you’re back, and I appreciate you stopping by. Thank you Deb! Hope you have a great evening! Shoot, I posted comment before rating the recipe! So here’s the rating – 5 stars!! Thank you so much! I really appreciate being featured this week too. It is always such an honor being picked from so many amazing recipes.v Happy FF Angie! That second photo down deserves an excellence in photography award… At any rate, combining the best of peanut and the best of chicken in a sandwich sounds decidedly fun. Thanks for sharing at Fiesta Friday! Thank you so much Diann! Our blogging community has been so generous with their awards! Thank you so much for co-hosting this week! 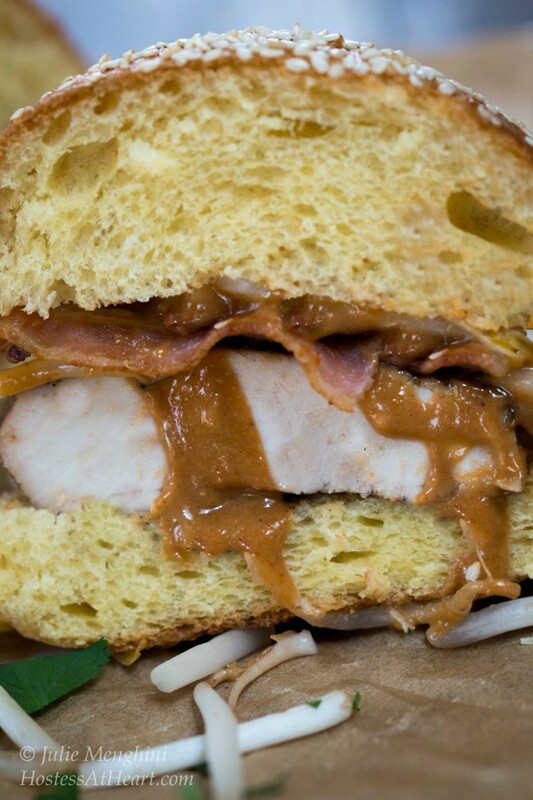 Peanut sauce + bacon?! I’m in love with this sandwich! Thank you Sarah! Bacon is a goooood thing! Thank you Julianna! I really loved that sauce! Whoa! 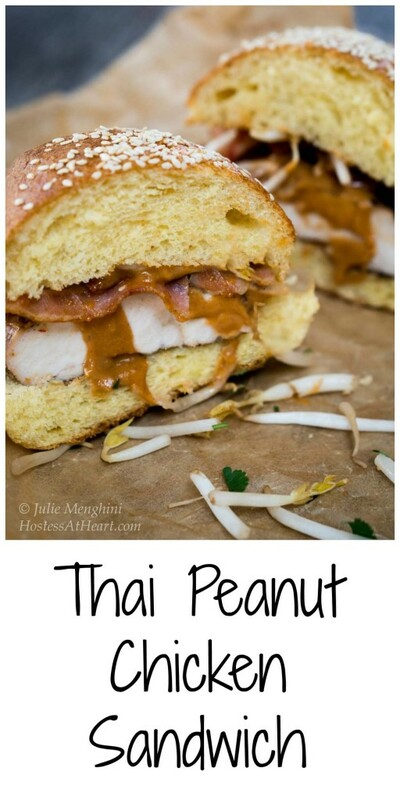 I never thought of Thai peanut chicken in sandwich! This is awesome, Julie! Thank you Jhuls! One of my favorite appetizers at a local restaurant has chicken skewers with peanut sauce so why not a sandwich? What an interesting sandwich, Julie! I know I would love it. I bet the combination of bacon and the peanut sauce was so good. My husband is allergic to peanuts so I would have to make it when he wasn’t around! 🙂 I think you should open a bakery or lunch spot. Have you ever thought of selling your breads? They are amazing! Thank you Shari! I could never cook as a profession. It would be too stressful. I would love to bake for a coffee shop or something small, but I am so spoiled right now that I can cook or bake anything that I want when I want, and if it fails no one is the wiser. I have two neighborhood children that are allergic to peanuts. It’s really opened my eyes. When I take them goodies I tell them what’s safe and what’s not. Heyy Julie! Long time. Really missed a lot of your posts. I am in love with this sandwich. Bookmarked. I love anything with Thai flavors. Need to try this. So very happy to see you Sadia! I hope all is well with you, and I’m very happy you stopped by. I hope you enjoy this sandwich. We really did. Have a wonderful evening! This looks so yummy and satisfying! I love that you added bean sprouts! Thank you! 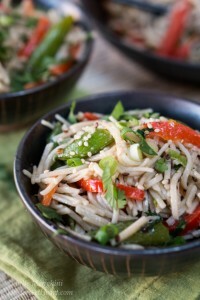 I really liked the crunch that the bean sprouts added. Have a wonderful day and thank you for your comments! Oh Loretta, That would be perfect! I hope you have a great evening and I’ll toast you with my next pour! Thank you Chitra! It’s a pretty lean sandwich with tons of flavor. Thank you Ana! Yummy for summer too! This sounds WONDERFUL Julie. I bookmarking this sandwich to try out immediately, your chicken looks SO moist. Great job! Thank you so much Jess! It really was moist and delicious. Hope you have an amazing evening! This sandwich runs the risk of being one of the best sandwich I have ever heard about. It looks super yummy! I can sink my teeth in this tasty creation Julie! Thank you Johanne! I hope you had a wonderful Mother’s Day! Looks delicious! David and I are all about sammitches! Thank you Debbie! I’m trying to get better about sammiches! They are easy and yummy but I rarely make them.